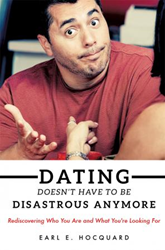 Earl Hocquard’s new book, Dating Doesn't Have to be Disastrous Anymore - Rediscovering Who You Are and What You're Looking For, ($11.99, paperback, 9781498438636; $5.99, e-book, 9781498438643) helps readers identify the “repeat pattern” of dating – when a person leaves one bad or unhealthy relationship and gets into another that's the same or similar. He explains why this happens and provides practical tools to get healthy, so all single people can choose healthier relationships. He stresses that each person brings good qualities and personal flaws into all relationships – a combination of a healthy and a hurtful past. Quickly, one realizes how much work a relationship demands. However, each partner can invest good things and expect to yield great results. This thought-provoking book is written from a professional psychological and spiritual point of view with real life examples and suggestions that work. Earl Hocquard serves as a licensed psychologist and an ordained minister. He has counseled people with relationship/marriage issues for many years. He grew up in a dysfunctional home and has experienced the pain of divorce. From training and life experiences, he has learned the many things that work and the ones that do not work. Xulon Press, a division of Salem Media Group, is the world’s largest Christian self-publisher, with more than 15,000 titles published to date. Retailers may order Dating Doesn't Have to be Disastrous Anymore - Rediscovering Who You Are and What You're Looking For through Ingram Book Company and/or Spring Arbor Book Distributors. The book is available online through xulonpress.com/bookstore, amazon.com, and barnesandnoble.com.